LISTENING NOTES: Demanding Command: Terry Snyder's "Persuasive Percussion"
Demanding Command: Terry Snyder's "Persuasive Percussion"
The set contains twelve instrumental standards such as "I Love Paris", "Tabu", "My Heart Belongs to Daddy" and "The Breeze and I". Not exactly reveloutionary stuff. The difference here is that tese tunes were specifically arranged to take advantage of the spacial effect of stereo. The separation is remarkable, although a purist's soundstage it is not. Instruments may move from left to right on occasion (mostly at the beginnining of a track for channel identification ). The recording is up-close and detailed, with incredible dynamic range. The percussion spices up the arrangements, and is ideal for demonstrating the stereophonic effect. The result is a lightweight yet thoroughly entertaining listen. I've got two copies of this record: One is the first label (gray and white) and the other is the second label issue (gold and white). The original is a beautifully pressed disc from RCA's Indianapolis plant; thick vinyl, quiet surfaces and excellent dynamic range. Suprisingly, the gold label disc was it's equal in sound. 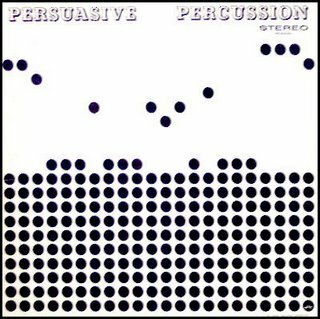 Persuasive Percussion is certainly some kind of classic, a milestone in stereophonic reproduction, that deserves a prime spot in any collection of early stereo records. Highly recommended!